Developmental, Psychiatric & Psychological Aspects of Children & Young People with Down Syndrome. Children with Down syndrome often have co morbid psychological, psychiatric and neurodevelopmental concerns such as autism and ADHD. These may go unrecognised due to diagnostic overshadowing or atypical presentation. Earlier identification enables targeted strategies and support to improve long term outcomes. This session aims to increase knowledge and understanding of psychiatric and neurodevelopmental presentations in children with Down syndrome and provide an overview of approaches to assessment and management. Dr Gita Croft will introduce this session on behalf of the Down Syndrome Medical Interest Group. Professor Jeremy Turk will give a presentation followed by opportunity for questions and wider discussion. Attendees are encouraged to bring along their cases for discussion. This session will be of interest to general and community paediatricians, neurodevelopmental paediatricians, clinical psychologists, specialist nurses and therapists who look after children with Down syndrome. Next deadline for submissions is 30th May 2020. The aim of this award is to encourage and reward research in the area of healthcare for children with Down syndrome. All the presentations from the World Down Syndrome Congress in Chennai are now available to view. This book provides doctors and other health professionals with the information they need to address the challenges that can present in the management of Down syndrome. 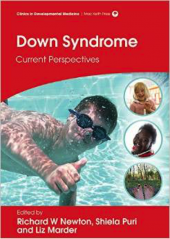 Chapters have been written by a number of internationally respected clinicians with a special interest in Down syndrome, including members of DSMIG UK and Ireland www.dsmig.org.uk with contributions from the Down’s Syndrome Association www.downs-syndrome.org.uk. Chapters include discussion of comorbidities, with background information and advice on assessment and management ,as well as the underlying biology and new developments in molecular genetics. Practical examples and case scenarios are included.